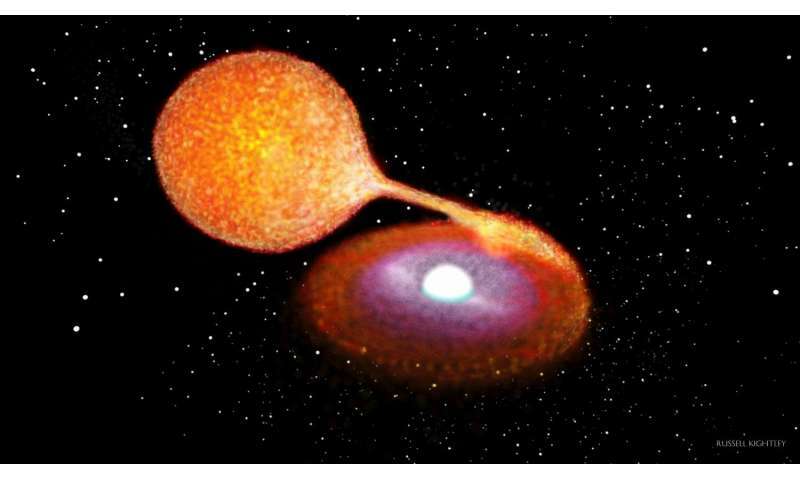 An international team of space scientists has found evidence of what they believe is a remnant of a type Iax supernova—a white dwarf moving in a way that suggests it was blown across part of the universe by the power of a thermonuclear explosion. In their paper published in the journal Science, the team describes their study of the star and why they believe it is the remains of an Iax supernova. Most space scientists agree that supernovae occur when a white dwarf pulls a certain amount of the outer layer from a nearby star until it reaches a tipping point—when that happens, a thermonuclear explosion occurs, obliterating the white dwarf—at least, most of the time. This so-called normal type of supernova is classified as Ia. But some theories suggest that the explosion is sometimes not strong enough to completely obliterate the white dwarf—some of it is left behind and pushed through space at a very high speed due to the energy of the explosion. Such supernovae are labeled Iax, but until now, none had ever actually been observed. In this new effort, the research team describes a white dwarf that appears to have all the markings of a supernova Iax remnant. The star, called LP 40-365, was actually first spotted back in 2013—it drew attention because it was traveling so fast. The researchers found that the star was spinning faster than expected and that it had a mixed composition, which suggested that it very likely once had a companion star. The researchers also note that in most cases, stars that move faster than normal are doing so because they were flung across their galaxy after traveling too close to its center. But the trajectory of LP 40-365 showed that it had not approached the center of its galaxy. The team suggests the evidence indicates that the white dwarf is most likely the remnant of a supernova—one that occurred between 5 and 50 million years ago. The team and likely others will continue to study the star to add further proof to their assumption. They believe it will help in better understanding what happens prior to a supernova, regardless of type. I can't wait for the day when all of the stars have been studied well enough that we can rewind the galaxy and virtually watch the journey of this star along with simulating the explosion that launched it on its path. Maybe the idea that stars are twinned is a bit off? Maybe it is that they 'bubble off' matter that is a spherical balls continuously over time? That these 'gas balls' are the first step in the companion formation? Maybe they are attached with an umbilical when being created and drift off after the sun has relieved itself of this excess gas? Maybe away from the birth mother sun they magnetically compact to have a core? This gas ball with a core may encounter other cosmic bodies which produce plasma arcing between them? Maybe even have a 3-body encounter? One of which could be an iron meteorite which is shattered coating the plasma sphere with iron dust and dusting the other planet with surface iron? Does that sound possible? Even likely? Perhaps the creation of our Moon? Or the white dwarf was a product of the explosion, not having existed prior. How can a supernova produce a white dwarf? I also, @Zen, would like to see some "working." Perhaps zen is thinking that the white dwarf they found is the core of the companion star that the white dwarf that went supernova was cannibalizing. Not sure if the companion star could withstand the blast long enough to be ejected. @Ironhorse, we'd need to see a mathematical physics proof that such an event could happen. And yes we could really figure out if it's plausible. If you want to present novel astrophysical hypotheses do the "working." Let's see the math. People should be welcome to politely present novel hypotheses, as Ironhorse has done, without doing the math. It is when people repeatedly INSIST on some hypothesis, without even bothering to do the math, that it gets annoying. It is actually a reasonable hypothesis: Fast moving stars have been explained by one star of a tight binary sheds enough mass through a supernova explosion to let the other star free. 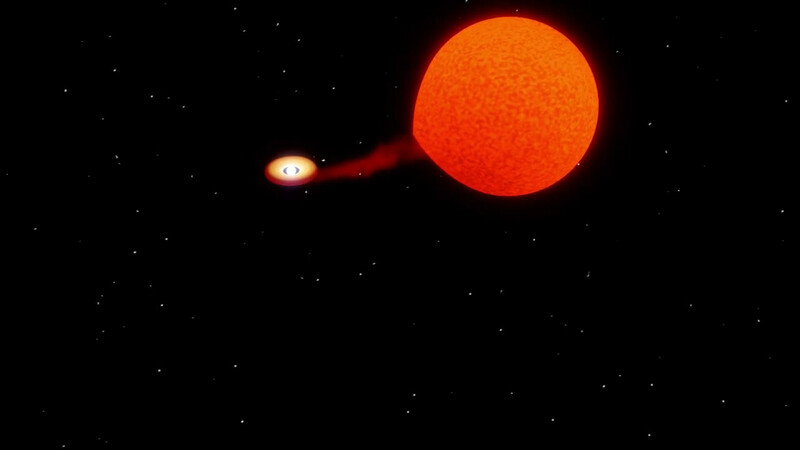 However In this case "The researchers found that the star was spinning faster than expected and that it had a mixed composition, which suggested that it very likely once had a companion star. ", and the supernova would be a bigger, and hence shorter-lived star, and hence not a companion feeding the white dwarf. 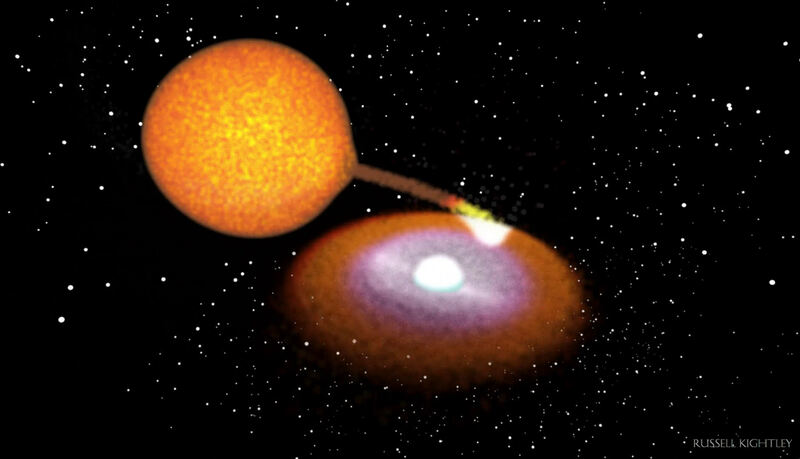 To make the hypothesis work it would have had to have been more than two stars, something like two close white dwarfs being fed from one red-giant companion, and one white dwarf goes over the limit first, goes supernova, and sets the other white dwarf free. I'm good with a plausible explanation, @RealSci. Just speculating without any supporting evidence looks too much like the cranks we get around here a lot in case you haven't noticed. I don't include @Ironhorse in that, but I'd encourage a more thoughtful post with some support if we're going to speculate. Maybe the speculations will be wrong; I respect @Ironhorse enough to expect s/he'll be OK with being right or wrong, and learn something either way. I cannot think of any prolific poster here who has never been wrong in a post (myself included). The cranks are indeed annoying, but what makes them so annoying is the endless repetition of arrogant posts that are dismissive toward others. A crank's posts being wrong merely amplifies the crime. Without those attributes the implausibility of a poster's speculation is more amusing than annoying. For example, katesisco's speculation above is so far off that it is amusing, and because it is polite I personally don't find it annoying. However if katesisco were to insist that mainstream scientists were idiots because they failed to agree with his/her brilliant insight, his/her posts would become annoying. @Real, agreed. Just being fussy I guess.